Custom laminated shade with 3-piece angular valance, sawtooth hem and stitched-down slat pocket, both with self-cord trim. 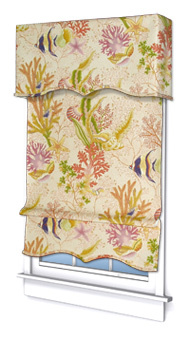 Shades laminated with the customer's own fabric or wallpaper (COM) add a whole new dimension to window dressing. They can be used alone, with matching valances, or in combination with side panels or top treatments to add privacy and/or light control much more economically than draperies. We offer fourteen different hem styles and a variety of custom features and trim options to create the ultimate designer touch. The Rollease bead & clutch lift system is standard on these shades, and motorization, using Somfy products, is a very popular option. Shady Ladies attention to detail makes your fabric laminated shades the perfect compliment to your other soft furnishings. We match every detail. Your pattern is centered on every shade above and below the slat pocket. Our self and contrast cord is always double welt and always cut on the bias, on stripes and plaids the pattern is always matched in the most complimentary manner. In most cases we can create a hemstyle of your own design or layout your pattern in a unique manner. Most of all Shady Ladies communicates with you about your order. If we have questions or concerns about the look of the final product we will contact you. We are always happy to help you plan your design or answer any question you may have. 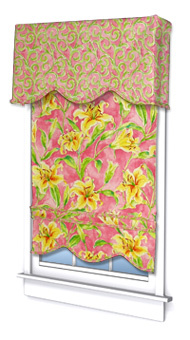 Shady Ladies' valances, made from your fabric or wallpaper, or from our fabrics, offer just the right top treatment. They can be made to match or to contrast with your shades and are light weight and simple to install, mounting on standard curtain rods! Our shades and valances are hand made by laminating your cloth or wallpaper to either room darkening or light filtering shade cloth. 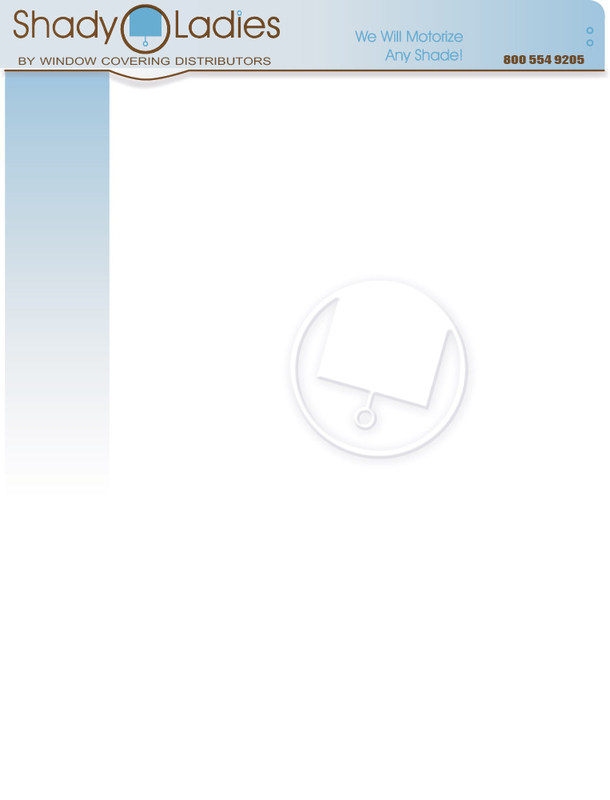 See our Hem Styles page for examples of fabric laminated hemstyles. Examples of 3-piece angular valance and 3-piece triple-curve valance are visible on this page. Fabric laminated shade with straight hem & self cord trim. Three piece triple curve valance with contrast inset & self cord trim. 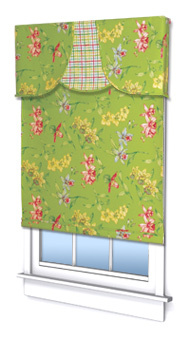 Fabric laminated shade with tempo hem style, stitched down slat pocket, contrast cord trim. 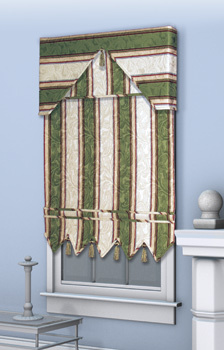 Contrast fabric laminated valance with Tempo hem style self cord trim.